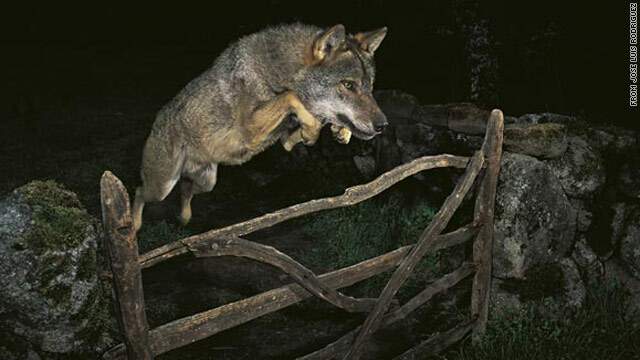 Jose Luis Rodriguez's image of a wolf won him the title of 2009 Veolia Environnement Wildlife Photographer of the Year. London, England (CNN) -- The winner of one of the world's most prestigious photography competitions has been stripped of his title for allegedly hiring a trained wolf to stage the winning shot. Jose Luis Rodriguez's image of "the storybook wolf" was chosen from 43,000 entries to win the Veolia Environnement Wildlife Photographer of the Year award in October 2009. Just three months later and after what they called a "careful and thorough investigation," the judges disqualified Rodriguez for breaking the rules. "The competition rules clearly state that photographs of animal models may not be entered into the competition," said Louise Emerson, head of business strategy at Britain's Natural History Museum. Rodriguez is said to "strongly deny" the wolf in his photo is a model. According to his Web site, the multi award-winning nature photographer is a regular contributor to nature and ecology journals and has more than 30 years' experience in the industry. Emerson said the judging panel was reconvened to investigate allegations that the winning photo was of "Ossian," a trained wolf available for hire from a nature park near Madrid. "Canada Real Open Center hires out Ossian to a number of people and they said this image could be the wolf Ossian," Emerson said. The judges put their evidence to the photographer along with a series of questions, but said Rodriguez's answers failed to erase their doubts. "I'm not at liberty to discuss his answers but he gave us five very, very full statements -- they didn't substantiate the original story," Emerson said. The photo purports to show one of Spain's wild Iberian wolves, which are said to be wary of humans who see them as a threat to game and livestock. The statement released with the photo said: "José Luis risked a slow shutter-speed to reveal the moonlit sky and conjure up the atmosphere of the place. He switched from using his Nikon D2X to a Hasselblad so he could get the exact framing that he had in mind." It is the first time in the competition's 45-year history that a winner has been disqualified. The rules also impose a lifetime ban on ejected entrants. "We trust photographers to follow the rules and 99.99 percent of the time that happens. We're really sad that this has happened," Emerson said. A new winner will not be selected as the initial judging is done "blind" and Emerson said that will not be possible now that the photographs are on public display.